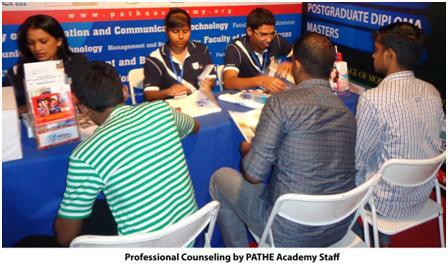 PATHE Academy (People’s Academy for Tertiary & Higher Education) is a leading provider of tertiary and higher education in Sri Lanka and has participated in the EDEX Expo which is Sri Lanka’s primary education & career fair. This event was held at BMICH. At the exhibition PATHE Academy was visited by the Honourable Minister for Education who was very impressed by the Education and the courses offered by PATHE Academy and its Partners. The Minister for Education was pleased that PATHE Academy’s vision to prepare professionals for the ever growing Sri Lankan hospitality industry, which is expected a peak in 2016, matched with economic targets and progress. The CTH Hospitality Management programmes, which are offered at PATHE Academy, are the best Tourism and Hospitality management pathway programmes available in Sri Lanka. For example, a PATHE student will be able to complete 1 or 2 years of studies in Sri Lanka and receive credit exemptions in more than 50 universities and colleges internationally such as William Angliss TAFE, Griffith University-Australia, HTMI-Switzerland, New Zealand, UK, Malaysia, Singapore and the U.A.E. Students can study a variety of disciplines such as Hospitality, Tourism, and Business Management. With this pathway students will be able to save 3 to 6 Million LKR when compared with first year direct entry into a foreign university.